So, needless to say, if duck is going in the pot in my kitchen it has to be a very worthwhile recipe and I hope you’ll agree that this one is. It uses a whole duck which I jointed using my trusty shears – a simple task once you have the knack, I’m sure, but one I’m still working on. After a long, slow cook with bedfellows of onion, carrot, celery and fennel as well as tomatoes and red wine, the duck falls from the bone and can be shredded into the sauce. I prefer to cook the meat on the bone with the skin still on which adds a wealth of flavour and richness to the ragù but, duck being duck, can make a fatty sauce. That’s the main reason that an overnight chill is essential for this recipe. 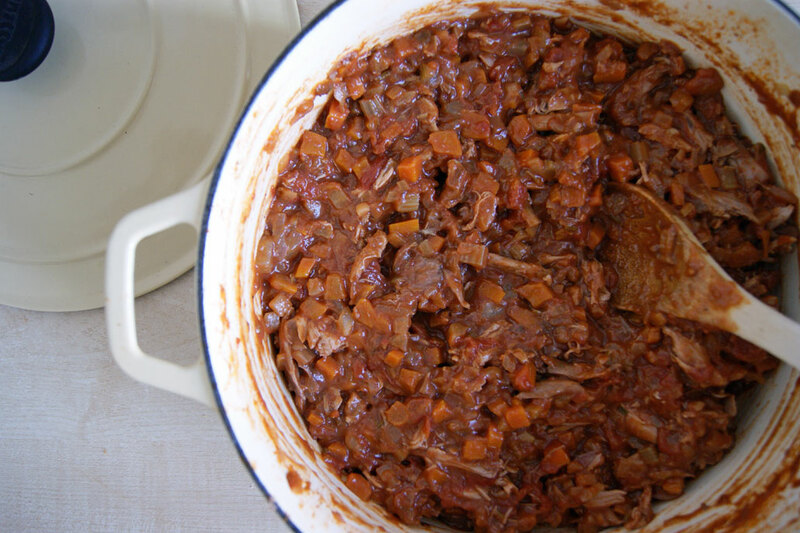 Once cold, you can skim off any excess fat which would otherwise make the ragù greasy and, as a bonus, the resting period allow the flavours to meld. Another personal twist is the use of tea rather than stock. I think cooking the duck on the bone (and making sure it is properly browned) gives plenty of meaty flavour so stock isn’t really necessary. I make a strong brew of lapsang souchong which imparts a wood smoke flavour and cuts through the fattiness of the duck emphasising the tomato and herbs. First prepare your duck. Remove the giblets* and set the liver aside for use later. Now you need to quarter the duck; poultry shears are the best and safest tool for this. Laying the duck breast-side down, carefully cut down either side of the spine and remove it. 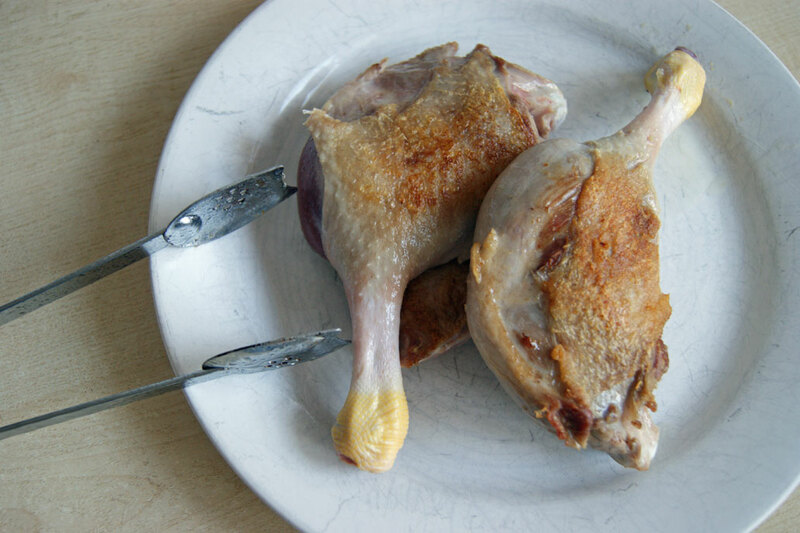 Cut the duck in half lengthways between the breasts then cut each half in two separating the breast (with wing still attached) from the leg. Put the olive oil in a large heavy pan and place over a medium heat. Pat the duck dry and brown in batches. A deep colour will provide lots of flavour so take some time over this. Once the meat is browned remove it to a plate and pour off all but 3 tbsp of fat in the pan. Reduce the heat and add the onion, carrots, fennel and celery and cook until soft, about 10 minutes. Add the garlic and fennel seed and cook for a further 2 minutes. Increase the heat back to medium and pour in the wine. Allow it to bubble and reduce by half before adding the tomatoes and rosemary. Brew the tea in the boiling water, remove the tea bags and pour into the pan. Stir well and add the duck and any juices into the pan. Bring to a low boil then reduce the heat to low, cover leaving a little gap for some steam to escape and simmer gently for 3 hours stirring from time to time. After 3 hours the duck should be tender and fall off the bone. Remove the pan from the heat and carefully take out the duck and place on a chopping board. Using two forks take the meat from the bone and shred. Discard bones, skin and any fat before stirring the shredded meat into the sauce. Leave to cool to room temperature then chill for at least 6 hours. Skim and fat from the top of the ragu then gently reheat until simmering. Finely chop the liver into a paste and stir into the hot ragu, simmer for a few more minutes (the live cooks very quickly, do not boil the sauce once the it has been added). Serve immediately over pasta or gnocchi. * You’ll be left with the giblets (minus liver) and spine which you can use to make stock.